For those who don’t remember from physics class, or were lucky enough to avoid it, the fourth dimension is time, which leaves one to wonder who has the time to read six issues of an interactive online magazine? I’d venture to guess that the Panamera consumer is someone who is entrepreneurial, has a family, loves technology, and spends a lot of his or her time working; thereby, leaving little time to sit through “The Porsche house of treasures” article. Fortunately, I have no life so I went through the site and found several articles justifying Porsche’s decision to build a four-door sports car. For those who didn’t know, Porsche actually developed a concept 4-seater in 1959 – The Porsche 754. This information thus justifies the decision to build the Panamera, even if some blogger naysayer feels they shouldn’t have. It’s in their DNA. So, there! 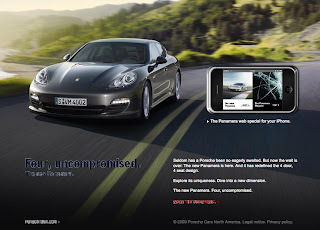 The good news for the busy Panamera consumer, well at least the ones with an iPhone in their pocket, is the six ezines are available in an iPhone application (download the app for iTunes here.) The iPhone application is actually far more navigable than the website. The article content is easier to page through and the images look great on the screen. Navigation aside, the content still suffers from too much marketing speak and very little information. Granted the car doesn’t show up in dealerships for a couple months, but the extensive content Porsche produced for this campaign misses what most consumers are after: specifications, availability info, and pricing. But it's obvious this is about marketing the brand, not catering to buyers. The least Porsche could do to appease buyers is provide some linking to the detailed vehicle content at Porsche.com. It’s too bad Porsche couldn’t have hired Autoblog’s Sam Abuelsamid to write for the Panamera ezine. Why? Because his one article on the car’s In-depth Tech Briefing and First Drive was far more informative and interesting than all of the encyclopedic nonsense used to justify the brand’s decision to make a four-door Porsche.